Promotion Poster for the new bachelor programme “Interaktionsgestaltung” (Interaction Design) at the Hochschule für Gestaltung Schwäbisch Gmünd. 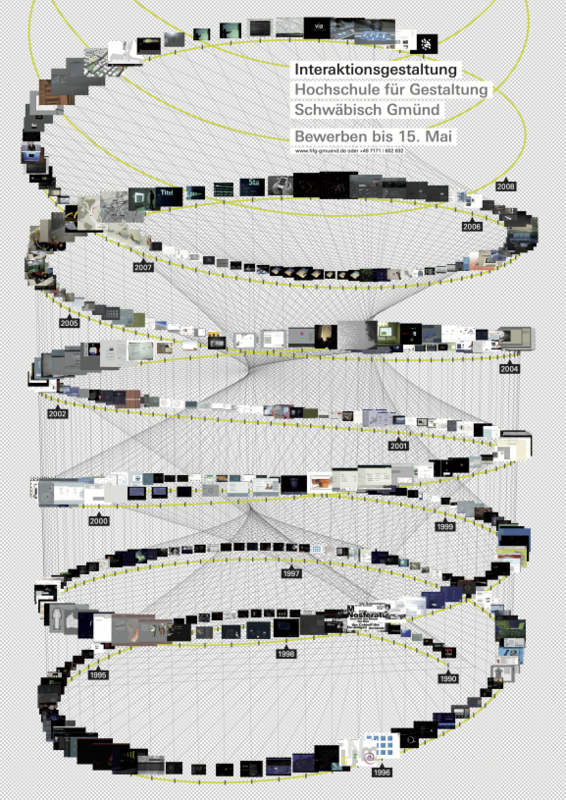 The Poster shows the long history of digital projects at the HfG Schwäbisch Gmünd over 18 years. Historical projects are stringed together in a helix shaped timeline with starting point in 1990 (bottom) until it ends with recent projects in present (top). The helix shape, the connection lines and the z-axis sorting were implemented with vvvv. The frames were imported to indesign and later filled with project documentation screenshots (in chronological order) via some Indesign scripting.